This report provides an examination of the length of time that low-income families receive government-funded child care subsidies that pay for part or all of the cost of their care arrangements. The figures presented are based on ASPE's analysis of a restricted-use version of child care subsidy administrative data from 35 states. 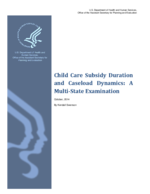 In general, the data presented in this report show that families utilize child care subsidy programs for relatively short time periods i n most states, usually less than a year, but frequently return to the subsidy programs after they exit. They are more likely to enter, leave, or return to the subsidy programs d u ri ng particular times of the year and these usage patterns often coincide with the school year calendar.